Some theories say that we evolved from the apes or the monkeys, and for tens and thousands of years, we have been evolving physiologically. That means that we have changed our appearance, we have changed the way that we stand, we have changed the way that we talk, and at some point, we became sentient or conscious. But that doesn‘t mean we’ve stopped growing. We are probably still evolving physiologically but we are also evolving in our consciousness in the way that we interact with life. No matter what your beliefs about human evolution, when we talk about personal development, what we are really talking about is the growth of an individual. Quite often, when people think about personal development, they try and simplify the issues. Our brains are one of the most complex computers in the world and to simplify them would not be doing them justice. That would be like taking a computer game of today and trying to run it on an Atari. Before we had access to the internet, computers, or television, people went to the movies to access general information. In fact, people used to go to the movies for the news, as people didn’t have a television set in their house. These days people get their information from a variety of sources, from books, magazines, newspapers television and many people go to personal development courses. The challenge is now that we have access to lots of information. On our phones, our watches, our computers and on our TVs. Which information is the right information? I often say to people, if they want more information, all they need to do is jump on a computer, go to Google, and search for: “How do I lose weight?” and they’ll get millions of results for how to actually lose weight. Same if you want to make money, you search for: “How do I make money” and you’ll get half a billion results of ways that people can make money. What about asking Google: “How do I find a better job?” If all they needed was more information, wouldn’t everyone be employed by now, have financial freedom and be at the perfect weight. Yet what people are finding is that more information was never the problem. What you can’t learn from Google is how you, as an individual, can lose weight, how you with your personality can make money or how you as a person, totally different to the person sitting next to you, can find a better job. What has happened is the personal development industry has changed. That means you can no longer put a thousand people in a room and just give them the same general information because everybody is different and they can find all the information they need on the internet. But two people who are trying to lose weight do not lose weight in the same way. Two people trying to make money don’t make money the same way. Two people going into business don’t go into business the same way and two people in a relationship don’t solve their problems the same way two other people do. You still need information but you need information specific to your situation, for a person in your environment, with your life experience, your personality, your problems, your structure and with your family life. How you lose weight or how you go into business or how you find the person you’re going to spend the rest of your life with has to work for the way that you interact, the way you speak and the way you hold yourself. There have been many great therapists in history and many would say that their methodology is the best way of working with people. However, when someone has their own methodology or a methodology that they rely on for their own livelihood, it’s hard to discern whether the results are as consistent as they believe, not because of them being a bad person, but because of confirmation bias. Confirmation bias is when somebody creates a theory and they notice more evidence that proves their theory rather than evidence that disproves it. Or even worse they have a vested interest in using their own methodology. To counteract confirmation bias it’s important to look at the results first, and not just the ones that worked, more importantly, the results that didn’t work, and then create a methodology around the data or the facts. There have been many psychologists and therapists that have looked at personal development this way and many of the ones that do, often find that people go through different cycles of growth, and matching a methodology to the cycle of a person is more important than whether one method is better than another. Since the 1950’s there have been a number of psychologists who have referred, in their own terms to cycles of human development based on their research and data. Dr Scott Peck who was a practicing therapist for many years; Dr Abraham Maslow who developed Maslow’s Hierarchy of Needs; Dr Clare Graves who was a professor at the Union college in New York, all talked about cycles of growth. During their careers all three therapists, developed different models of human psychology which all talked about cycles of development. Dr Graves saw a problem with a number of theorists as they all spoke of a final “stage” or “level” of human development. He believed that human development was an open-ended process with no end point and that people continued to grow throughout their life. He also noticed the frustration in his students as they tried to make sense of different theories. Many students were curious on whom, out of all the competing theorists, was ‘right’ or ‘correct’. Clare was unable to answer these questions due to elements of truth and error in so many of the theories. This is where it’s possible that many of the theories on personal development fall down, because every individual is different and every individual is in a unique situation. There is nobody else who is exactly like you, yet we often try and copy someone else’s diet, money making strategy or the way someone else has a relationship, without asking more complex questions like; Does this person have the same emotional structure as me, are they in the same type of environment with similar resources and ultimately are they the right person to model? In 1952 Dr Graves began a 30 year research career looking for answers to one question: “What does the biologically mature adult human being look like?” The first questions he asked was; What does it mean to be a healthy person and what does it mean to be an unhealthy person? What is the definition of an unhealthy person? Is having a bad emotion unhealthy? Graves started his study by asking people to record what they perceived as a healthy adult on an annual basis. The data was then collated and assessed by a panel of independent judges. In personal development, we’re talking about change and quite often, we’re talking about significant change, either in ourselves or in the world around us. Are you sad? Are you unhappy? Are you looking to experience better emotions in your life? Maybe you’re single and you want a relationship? Are you shy and want to be extraverted? Are you struggling to pay the bills? Do you want a better job? Peck, Maslow and Graves asked similar questions and they realised that when people grow, they adapt to a cycle which is best suited to their environment and that no cycle is better or worse than another. Regardless of how different we are or how much variety we have, there are different cycles that people go through over the course of their lives. You may remember times in your life when you were feeling less than good about life, or when things weren’t working the way you wanted them to and then all of a sudden, something happened and you went through good times. For a few years, maybe even as long as 10 or 15 years, you were happy or healthy, then before you knew it, you’d started the next cycle, which was unhappy or unhealthy and things weren’t working out for you again. After years of research on March 19, 1973 Graves presented a three part paper at a meeting held at the National Institute of Mental Health in Washington D.C. He stated that psychologists have and would never have, a single theory that would encompass all human behaviour and that it would be more productive to compliment theories alongside each other, rather than contradict them. He also stated that it is likely that each theory carries a certain measure of truth and rather than sticking to one we should broaden our understanding by utilizing all. Different methodologies used at different times in different environments with different people living in different situations will work best. So, the trick is not whether a methodology works or not, the trick is matching the methodology to the situation, and we believe that’s the future of personal development. People only go through a couple of these cycles throughout their entire life. Have you known somebody who had a mid-life crisis and it was almost like they were a totally different person after going through it? Have you ever seen somebody go through a significant change such as going from being totally shy to totally extroverted? Or from being overweight to losing 20 or 30 kg? Did you notice their behaviour changed? Did you notice the way hold their body changed? Did you notice how they speak changed? Do you think the things they think about changed? These cycles of life are inevitable. They are literally written in the deepest recesses of our psyche. In personal development people often refer to growth. As human beings, we’re a life form, and like every life form, our ultimate purpose is to grow and fulfil the cycle of growth to the best of our ability. But what would happen if we chose not to keep growing either emotionally, physically or consciously? When a plant stops growing, it starts to perish. Would a plant intentionally not look for sunlight or take in the water that gives it life? Most people believe that growth can be increased. Consider a rose bush. For it to grow, quite often it needs to be pruned back. Many times as a young man I remember doing chores around the house. My father would take me outside and we’d prune the rose bushes. We’d cut off the roses, and they’d grow back stronger. In personal development, quite often, we focus on growing faster. Have you ever tried to make a tree grow faster? What we need to do is get out of the tree’s way. Essentially, we’re making sure we don’t do anything that would prevent its growth. We don’t make a tree grow faster! We make sure it gets access to sunlight, the right soil, adequate nutrients and enough water and then we just get out of its way and let it grow. Human beings are the same. Rather than trying to find a way for someone to grow faster, we need to give them what they need to fully function emotionally and internally and then get out their way and let them grow. There are a number of things that can get in our way, but in these cycles what quite often happens is that people get stuck in one cycle of growth. This is like when the tree doesn’t get what it needs or even worse it starts to get weeds growing around it. When we get stuck in one of these unhealthy growth cycles, the pain increases. Ordinarily, there can be some pain when we grow, but that pain is just like us pruning ourselves. What happens sometimes though is that people get to a point where they’re really stuck, the pain increases and then they can’t find the way out. When people move from a healthy cycle to an unhealthy cycle, quite often we ignore the early warning signs, minor things that happen in our lives to indicate we’re off track and we wait until we’re really stuck. These indicators may be in our intimate relationship, our relationship with our kids, our health, careers or even in our search for meaning and purpose in life. When we ignore the little things, the problems get larger and larger, the pain increases and this can go on for years, until a person hits a threshold. Unfortunately by waiting for the threshold, quite often we put the things we love most or the things that are most important to us at risk. At this point the person can prune the rose bush and face a little more uncomfortability. They’ve suffered enough to motivate them to do the things they know they probably should have done years ago and they want to do everything they can to prevent losing the things they love most in life. Or they don’t do anything and just hope something changes. No-one wants to hurt, or lose their relationship, or lose their job. Pruning the rose bush is no guarantee that less than good things won’t happen; it just gets people from stuck to unstuck. The best guarantee is of course facing things early. Sometimes people realise they have to make a change and get past the unhealthy cycle and into the healthy cycle and sometimes people get stuck. 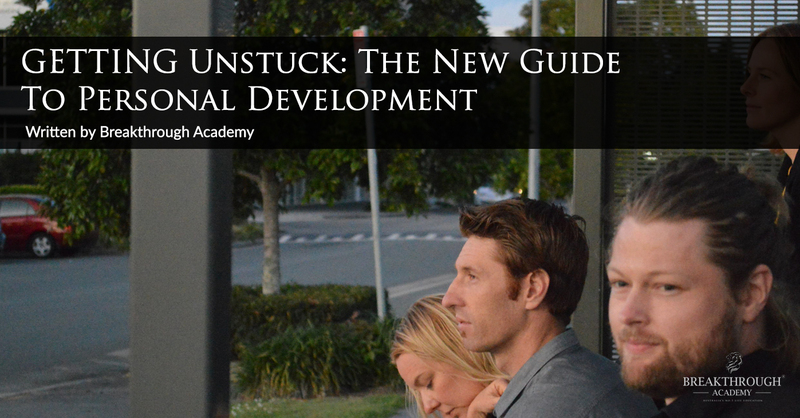 In personal development, we should be helping people to become unstuck, not necessarily to grow faster. The first step is to help them find what they need internally, emotionally, in their thinking and in their behaviours. The second step is to help them develop an amazing environment that supports and nurtures them. Then all we have to do is get out of their way and give them time to grow. Once we get rid of all the impediments preventing or stopping their growth people start to grow naturally. Unfortunately, quite often, people will only take action when they are really stuck and have hit a threshold in one of the cycles of life. This personal development course will give you the gift of life. I recommend this course to everyone who has ever been stuck in their life. What has happened is the Personal Development industry has changed. No longer do we need more information. We need specific information that helps us as individuals to grow. Quality – not quantity. Personal development isn’t just limited to the things you do at a course for a day, it’s all about the perspective you carry with you through life and it’s endless journey. What a great article, with a brilliant perspective on the future of personal development and growth that needs to happen. Great read, loaded with gems. Taking the first step become unstuck is the most significant step you will every take. Why wait? A refreshing approach backed by research which cannot be disputed.